Здесь представлена вступительная статья (эссе) к шестой главе каталога каталога, сопровождавшего выставку работ художника эпохи Возрождения Фра Анжелико (15 век) в Музее искусств Метрополитен в Нью-Йорке в 2005 году. Автор статьи - Магнолиа Скудиери (Magnolia Scudieri) - директор музея Сан Марко, Флоренция, Доктор наук по средневековой и современной истории, автор нескольких книг. Throughout its critical history the fresco cycle at the convent of San Marco has provoked endless questions regarding the participation of assistants or collaborators in its execution, their identity, and the extent of their responsibilities, even though the series has the rare distinction of being recorded in an authoritative contemporary source, the Cronaca — the fifteenth-century chronicle of the convent — which attributes it unequivocally entirely to Fra Giovanni da Fiesole. (*1) To anyone studying the frescoes attentively, these questions, as well as the sometimes contradictory answers that have been proposed for them, must appear to be completely justified. Since the nineteenth century, along with scholars like Berenson(*2) who assigned all or almost all the frescoes to the hand of the master, there have been others who discerned differences in style or quality — even though frequently not in the same passages — which might be imputed to the interven-tion of collaborators;(*3) the latter were referred to either generically or as anonymous personalities, and only occasionally were identified hypothetically with artists known to have worked with Angelico, such as Zanobi Strozzi and Benozzo Gozzoli. (*4) In the mid-1950s, the perception of inconsistencies throughout the cycle led to some highly restrictive positions, such as that of John Pope-Hennessy, for whom Angelico's contribution was relatively limited compared to that of several anonymous artists active at his side. (*5) Others, like Mario Salmi,(*6) reaffirmed Angelico's overall responsibility, even while recognizing notable variations in quality — especially in the frescoes on the upper floor — which they felt could be explained not only by the presence of assistants but by developments in Angelico's own style over time, presupposing a broad range in dates among the various parts of the cycle. 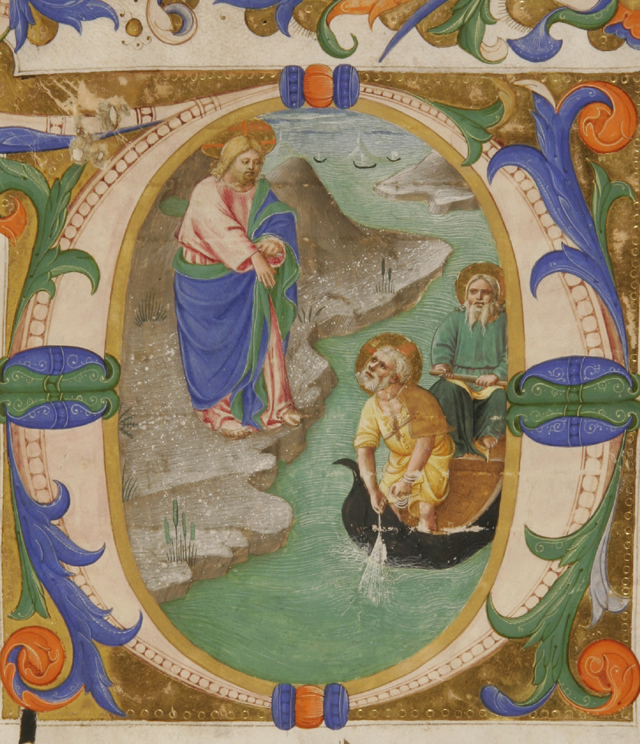 This more inclusive avenue of interpretation, which credited the master with the conception and layout of the frescoes even in those parts executed by others — by virtue of the designs (sinopie or cartoons) he provided for them — was also accepted by Francini Ciaranfi,(*7) Collobi-Ragghianti,(*8) and by Umberto Baldini in the catalogue of the Angelico exhibition of 1955. (*9) While acknowledging the discrepancies in execution, Baldini sought to emphasize, on the occasion of that exhibition, that "the collaboration — which undoubtedly took place — was never a substitution [for the master]. 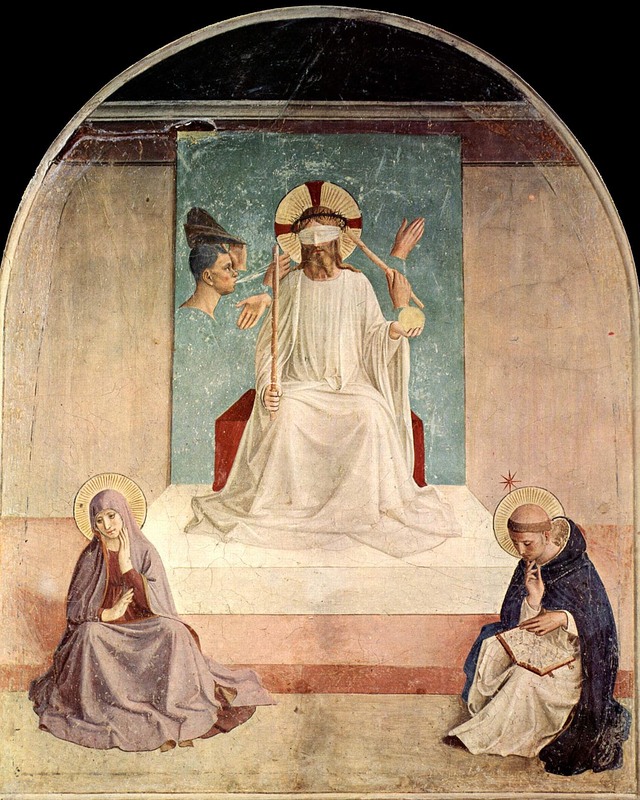 "This reassertion of the uniformity of vision that informs the cycle, determined by Angelico's role in the conception and supervision of work on every fresco, has been accepted by virtually all subsequent scholars, and remains to this day a basic assumption, even in the search to identify different hands involved in the execution of the series. 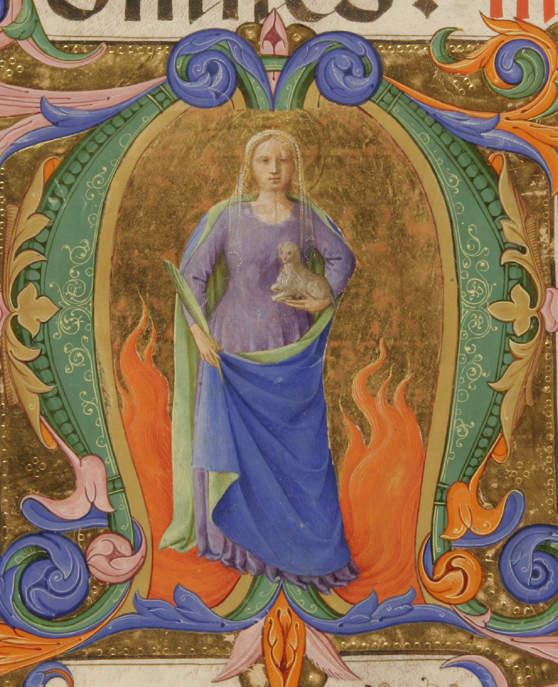 The increased interest in Benozzo Gozzoli during the last several years — resulting in several monographic studies and in the recent exhibitions in Perugia and in Montefalco(*14) — and the efforts to reconstruct the less certain, early phase of his career, have led scholars to acknowledge the circumstantial likelihood of the artist's presence at San Marco, and to extend the limits of his participation in the execution of the frescoes. 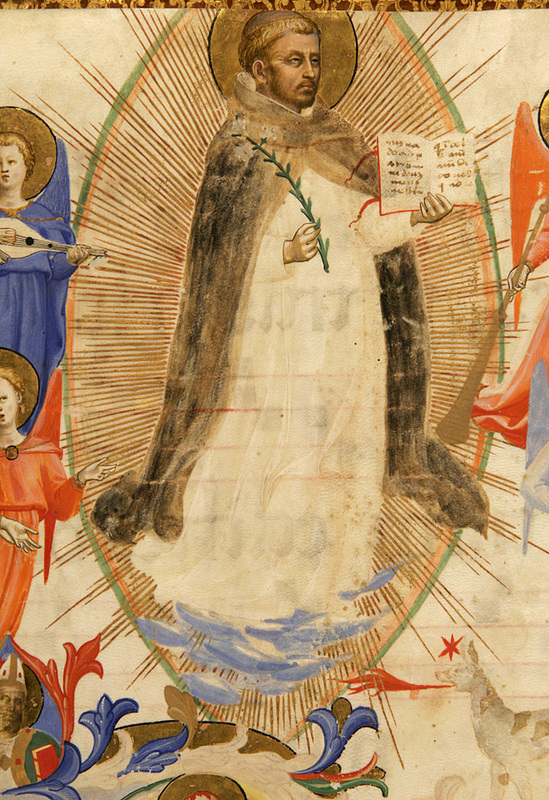 Thus, Bonsanti(*15) has identified Benozzo as the number one assistant, who supposedly collaborated with Angelico in some sections of the frescoes in the cells on the outer wall of the east corridor (he is presumed to be the author of the Virgin in cell 7, of the Three Marks and the Christ in cell 8, and of the Two Saints in cell 11) and on the decorative band framing the Crucifixion in the Chapter House. Over the master's design, he would also have executed all of the frescoes on the opposite side of the east corridor (in cells 22 to 30), and, probably, with some assistance, all of the frescoes in the north corridor and in the south corridor as well. In substance, this hypothesis has gained the support of Padoa Rizzo,(*16) who, like Bellosi,(*17) is more prudent, however, in her assessment of the cells on the inner wall of the east corridor and of part of those along the north corridor. 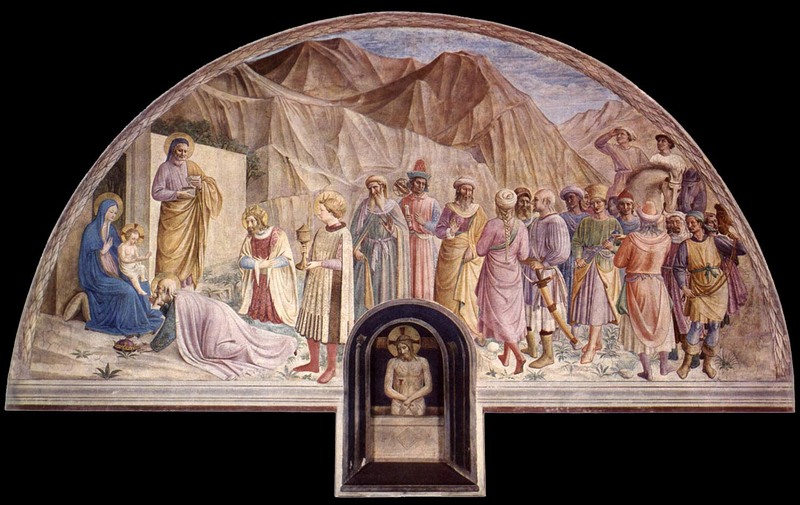 The recognition of Gozzoli's intervention in the cycle — albeit not so extensive — is implicit in the opinions of Paolo Morachiello, Diane Cole AhI, and Cristina Acidini Luchinat,(*18) all of whom also favor the notion of the artist's increased independence, in the design as much as in the execution of the frescoes, following his activity in the Chapter House: first in the cells of the east corridor, then in the south corridor, and fmally in the north corridor. 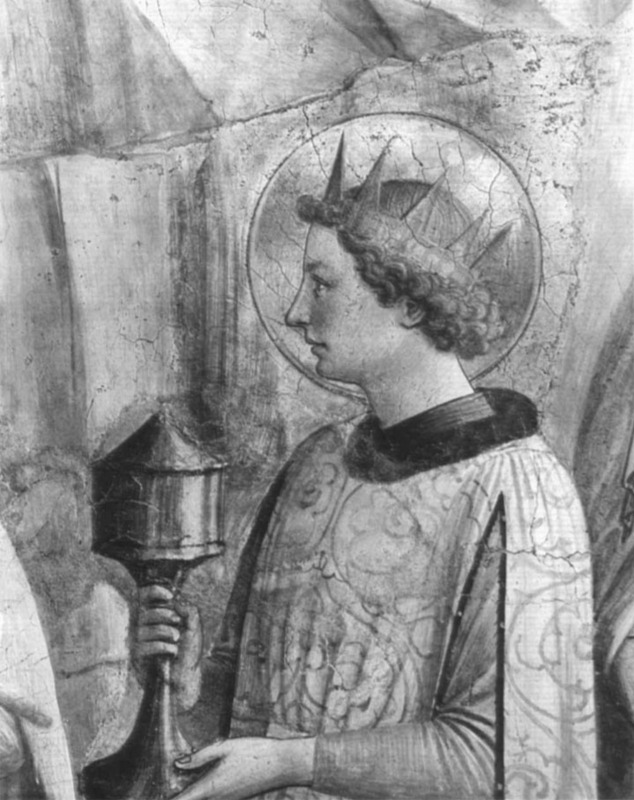 An isolated voice in this debate is that of Miklos Boskovits,(*19) who appears never to have been in doubt about Angelico's substantial authorship of the frescoes, and, in the most recent consideration of the argument, has strongly disputed the role attributed to Benozzo at San Marco,(*20) reasserting Angelico's responsibility for the entire cycle — excepting the decorative band surrounding the Chapter House Crucifixion — and regarding those differences that others have imputed to the intervention of assistants as, instead, the result of distinctions in date and the evolution of the master's style. The existence of such a range of scholarly opinion is unquestionably an indicator of the complexities inherent in the interpretation of the San Marco frescoes, suggesting the need for a general reconsideration of this work, in light of the various arguments fueling the debate. Above all, I am convinced that the discussion would profit from a more in-depth analytical study of the frescoes that took the technical data into proper account alongside the stylistic evidence and situated the arguments within a chronological framework that, itself, perhaps deserves to be reconsidered. In this regard, I believe it might be useful to begin by reexamining the historical circumstances under which the frescoes originated, through a critical reading of the documentary sources, in order to circumscribe better the possible chronogical parameters of the project. The Cronaca is silent with regard to the period and the circumstances surrounding construction of the other dormitories and remaining parts of the convent. Following its narrative thread, which appears to be chronological (although one cannot exclude the possibility of some omissions), we learn that in 1438, the Medici turned their attention to the church, which resulted in the commissioning of a new altarpiece from Angelico. Having obtained the patronage of the main altar of the church, Cosimo and Lorenzo had proceeded to promote the construction of the new tribune with an altar ornamented with marble intarsia decoration, "totum de lapidibus sectis ac politis," which unfortunately has been lost. 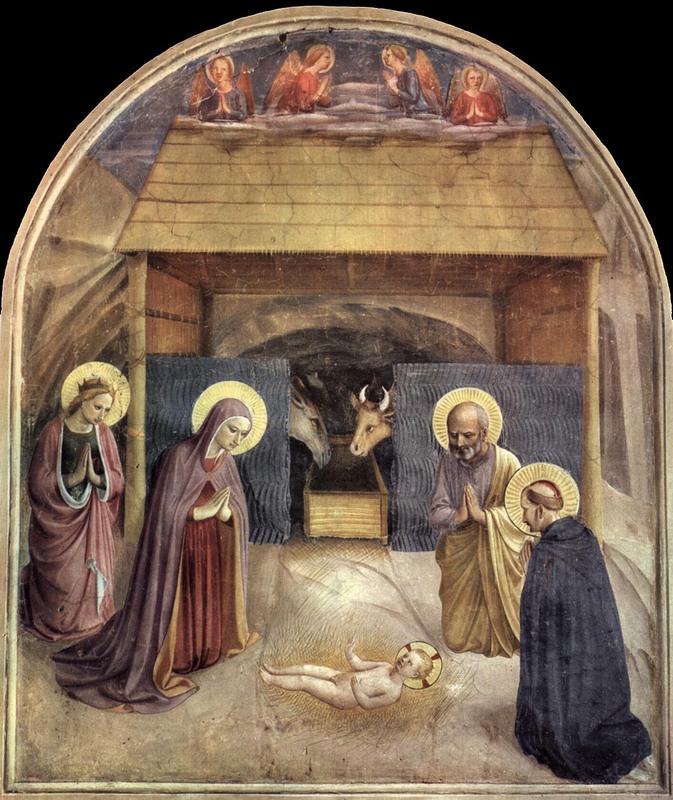 (*27) The same year also witnessed the Medici's decision to award to the convent of San Domenico in Cortona the polyptych by Lorenzo di Niccolo that had decorated the old altar, substituting a new altarpiece by Angelico for it, which would adequately celebrate their new patronage. 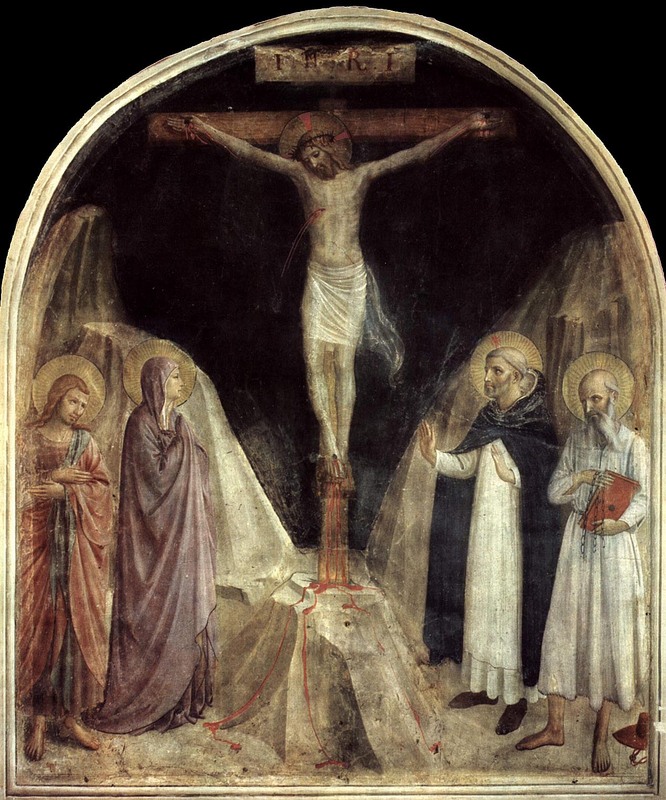 (*28) An inscription added at the base of Lorenzo di Niccolo's painting, alongside the Medici arms, records that the transfer took place in 1440, even though Angelico's new altarpiece, as the Cronaca states, was not yet completed. (*29) One of the predella panels now in the Museo di San Marco in Florence, portraying The Burial of Saints Cosmos and Damian and Their Brothers (fig. 119), is set before the church in the Piazza San Marco and provides a useful chronological point of reference for the altarpiece. In theory, this period would have been sufficiently long for Angelico to have carried out the project even single-handedly, given the limited number of giornate required for each fresco; that the execution took place in successive phases would also account for certain stylistic variations among the frescoes that are considered autograph. On the other hand, it should be noted that the actual time available to the artist to execute the frescoes is significantly reduced if one considers the intervals between the various stages of construction and the artist's concurrent activity at the churches of San Marco, San Domenico in Cortona (where he is documented in 1438), and San Domenico in Perugia (albeit over a protracted period)(*36) — all of which perhaps made the collaboration with other painters indispensable in order for the work to have been completed by 1443. 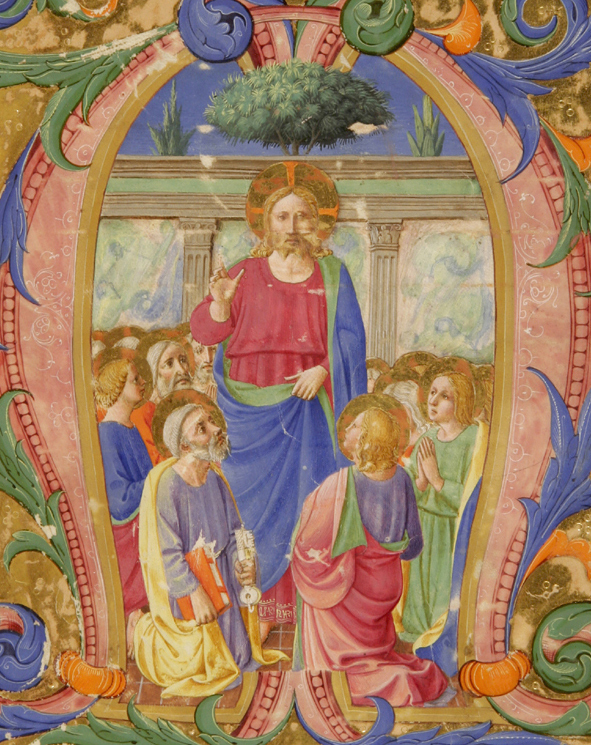 Visual evidence, indeed, suggests that this collaborative enterprise cannot be reduced to the intervention ofa single assistant (identified as Benozzo Gozzoli), since it entailed the creation ofa stylistic idiom generically indebted to Angelico and, despite its various manifestations, sufficiently uniform in vision as to make the distinction of individual hands difficult. A fresco cycle such as this one surely demonstrates how the notion of individual authorship by necessity should be extended to include those parts of the series not executed directly by the master, but — as was the case with Angelico — invented, drawn, and overseen by him. An examination of the frescoes, and of their division into working giornate, allows one to discern with a greater assurance the intervention of different painters, even within a single scene, and provides a sufficiently informative picture of a fully developed workshop — one that included perhaps four or five collaborators working alongside Angelico, who was active sometimes as author, sometimes as coordinator, and sometimes as supervisor of the project. However, before proceeding with the identification of these collaborators, it is necessary to isolate their respective contributions, and, as yet, these have not been clearly determined. (*37) Even the attributions to Gozzoli, unanimously regarded as having been the main assistant, seem less obvious to me than others have proposed — especially in light of the stylistic heterogeneity of those passages that have been assigned to him over the years, and of the difficulty in comparing them to works that are securely autograph — although perhaps distant in date. The latter — such as the frescoes in Montefalco, of 1450-52, and those in the Medici Chapel, of 1459 — are themselves the product of collaborations with other artists. The intervention of assistants is discernible, albeit to varying degrees, throughout the San Marco cycle, even in the frescoes in cells along the outer wall of the east corridor, where, by common admission, the hand of Angelico predominates. The Mocking of Christ in cell 7 (fig. 98) offers a pertinent example of the decisive impact that examination of the giornate can have on our understanding of the creative process. 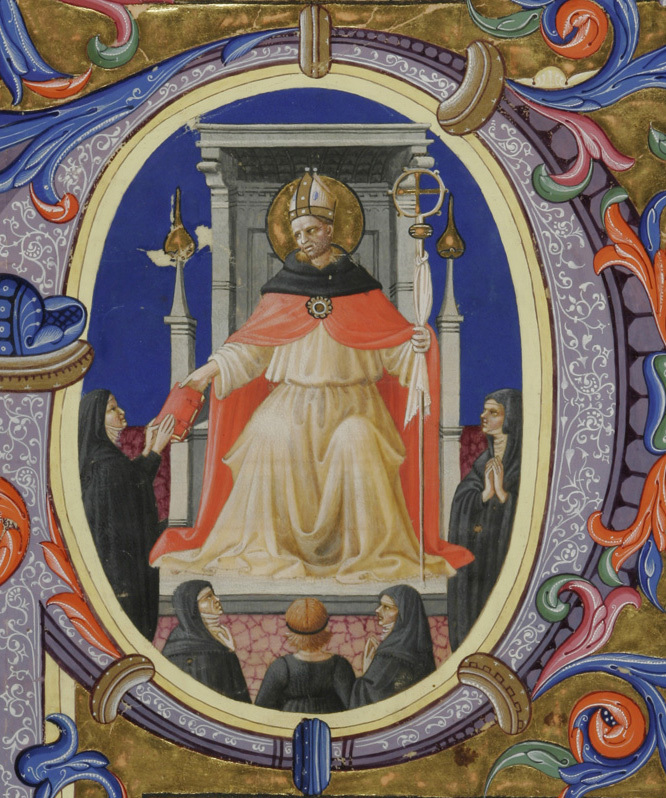 In the seated figure of Saint Dominic one observes a noticeable variation in style, quality, and technique between the right hand — clear, translucent, and modeled like the head — and the left hand, which is differently proportioned and made ponderous by its dense coloring and heavily drawn outlines. These distinctions were difficult to explain until more careful scrutiny of the wall surface revealed that the upper portion of the figure, including the right hand, was included in one giornata (painted section) of intonaco, and the rest of the figure in another. It becomes possible, therefore, to attribute the stylistic discrepancies between the two parts to the intervention of an assistant — obviously gifted in the painting of draperies — to whom Fra Giovanni would have entrusted the completion of the figure. 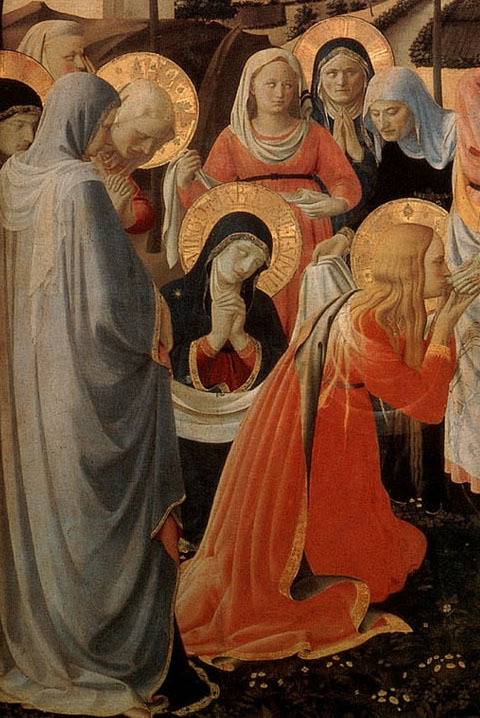 The same opaque palette and unmodulated contrasts of light and shadow also characterize the figure of the Virgin — painted on another giornata — which has generally been regarded as the work of a collaborator identified by most scholars as Gozzoli. 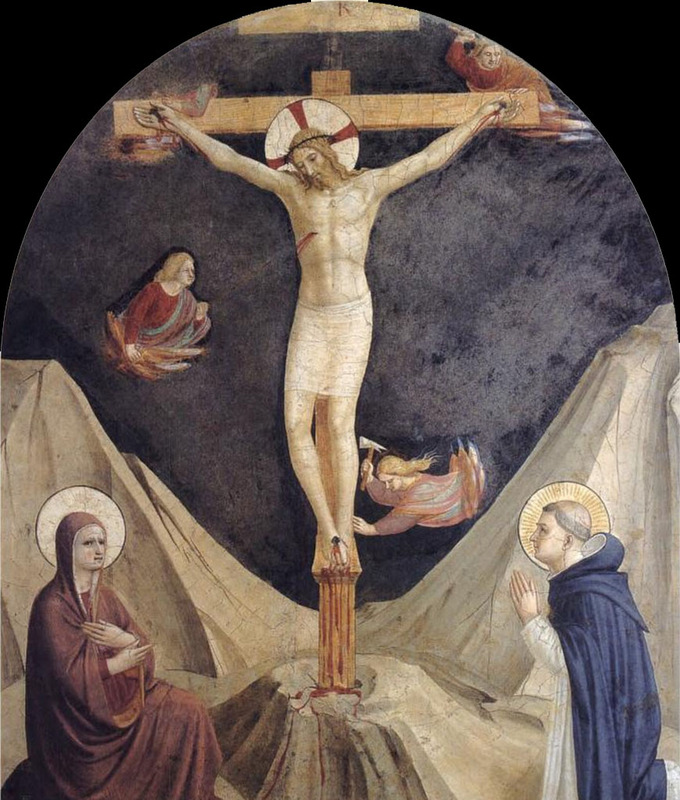 (*38) The attribution appears confirmed in the present case by a comparison with Benozzo's frescoes in the church of San Francesco in Montefalco — especially with a figure such as that of Saint John the Evangelist in the vault, whose robe echoes the dense chiaroscuro and the voluminous folds of the Virgin's mantle, and is spread out around him in the same way. Gozzoli's hand has also been identified in the execution of the Three Manes in the fresco of the Holy Women at the Sepulcher (fig. 99) in cell 8. 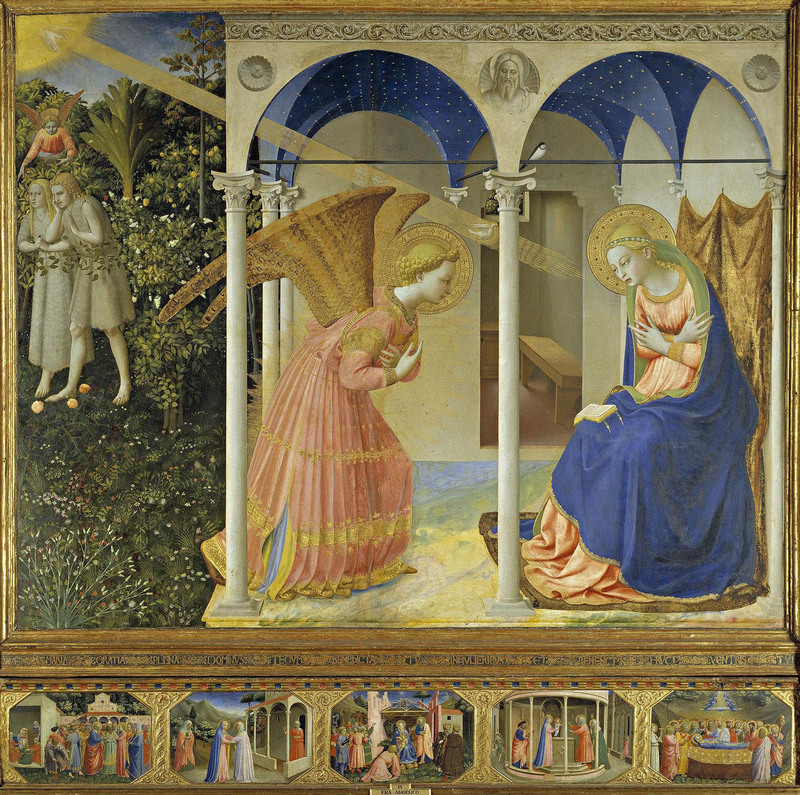 However, while there is no doubt that the author of the Virgin in cell 7 was responsible for the two figures in the background of this scene, it is questionable whether he also painted the third figure in the foreground, distinguished by a less opaque palette and by a crisp drawing technique that may be ascribed directly to Angelico — the author, in my opinion, of the rest of the fresco. In support of such a hypothesis is the discovery that this figure occupies its own giornata, separate from the one on which the other two are painted. 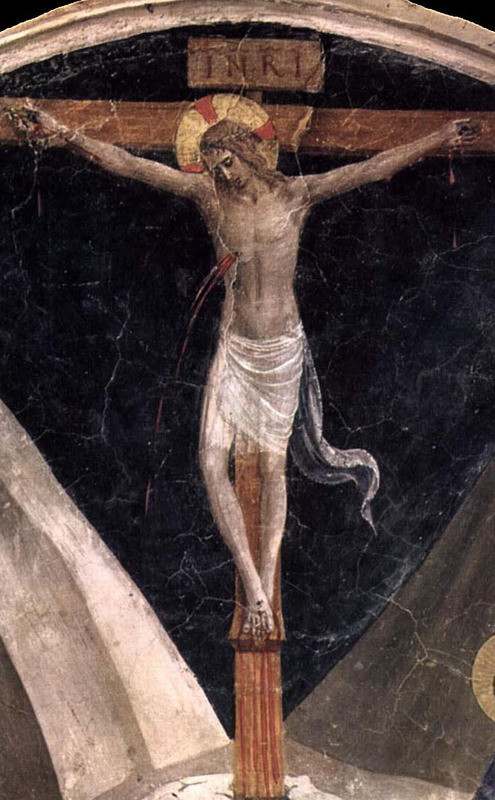 Yet another significant example of the subdivision of labor within a single fresco, and its significance for our interpretation of the resulting image, is offered by the Crucifixion in cell 4 (fig. 100); only an accurate mapping of the six working giornate that constitute this fresco would allow us to speculate on the intervention of assistants, thus justifying certain lapses in quality that sometimes are evident within the same figure. 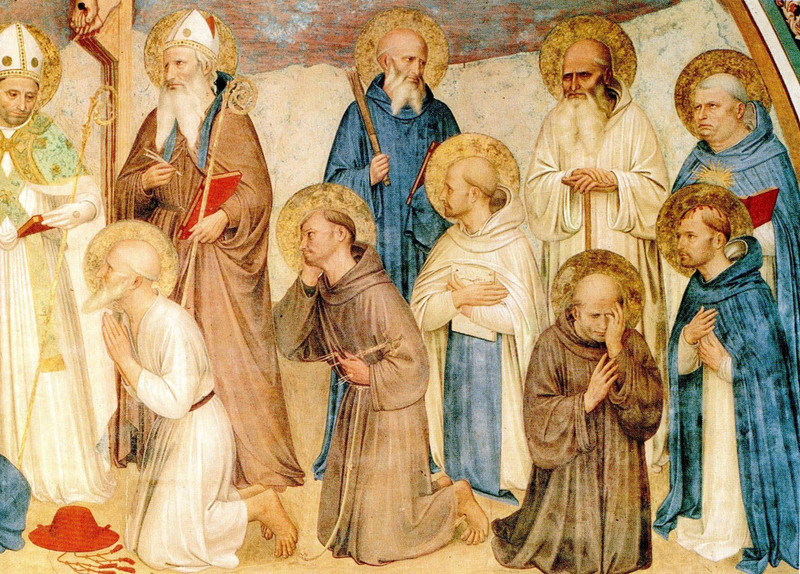 This would seem to be the case with the figures of Saint Dominic and Saint Jerome, in which the high level of execution of the heads, painted at the same time in a single giornata, unquestionably by Angelico, does not appear to relate to the slightly rigid, schematic treatment of the rest of the bodies; this is especially apparent in the poorly attempted foreshortening of the hands of Saint Dominic. 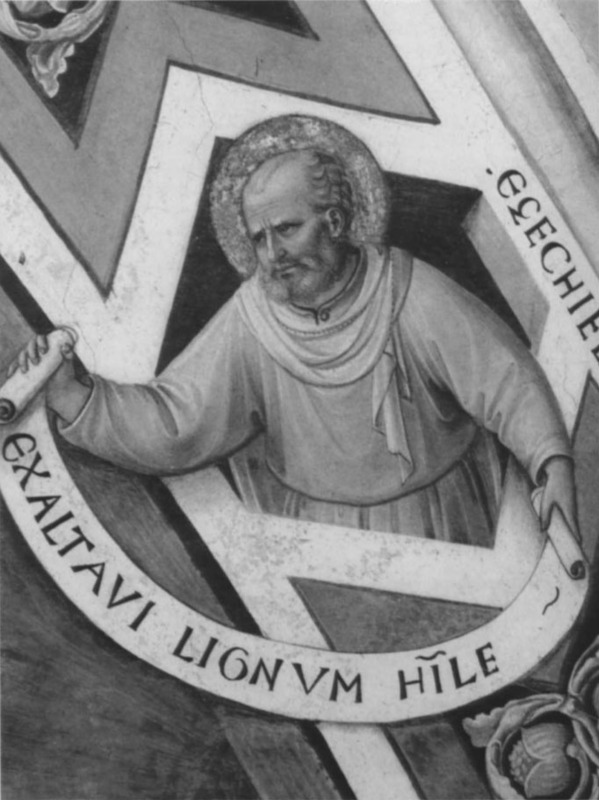 Doubts about authorship are also raised by the rendering of the head of Saint John the Evangelist, which is painted on a different giornata than the body; while reflecting Angelico's manner in its general outlines, the proportions appear somewhat too reduced and the expression too exaggerated for the hand of the master, suggesting the intervention of another artist, even though a plausible candidate remains to be named. 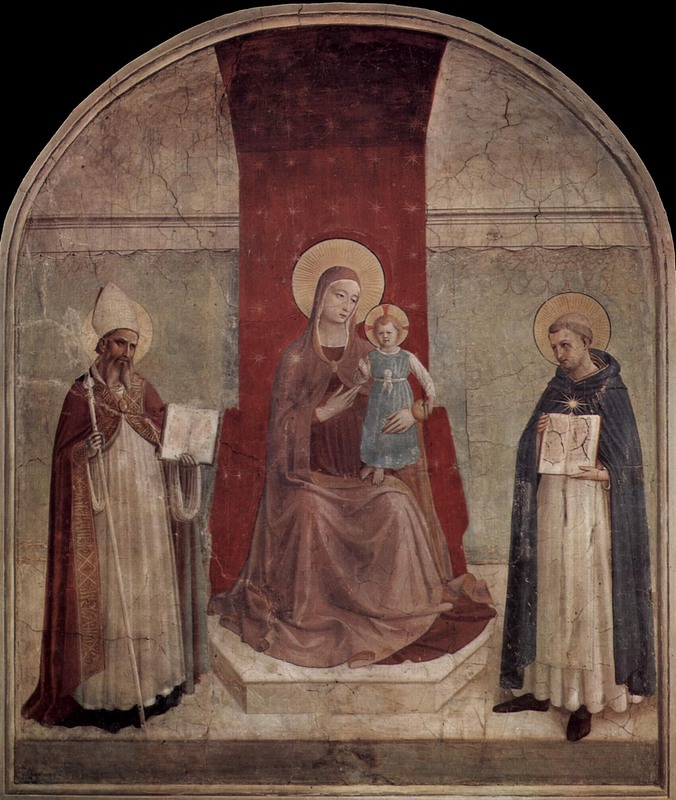 In other instances, such as the Madonna and Child Enthroned between Saint Augustine and Saint Thomas in cell 11, the subdivision of the giornate corresponds to whole figures or groups, making it easier to distinguish the hand of the master — recognizable in the figure of Saint Augustine — from that of a mediocre assistant, whose intervention may be detected here for the first time; that same artist may be identified again in the decorative surround of the Chapter House Crucifixion, where he was responsible at least for the depiction of the blessed in the first medallion on the right. In any case, this is not the same assistant who executed the slackly painted figure of Saint Dominic in the Lamentation in cell 2 (fig. 149), and perhaps also that of Saint Peter Martyr in the Annunciation in cell 3. The frescoes on the other side of the corridor are quite different. Their more simplified and repetitive compositions are marked by a generally more archaizing tendency characteristic of Angelico's vocabulary of a decade earlier, which still reflected the influence of Lorenzo Monaco. 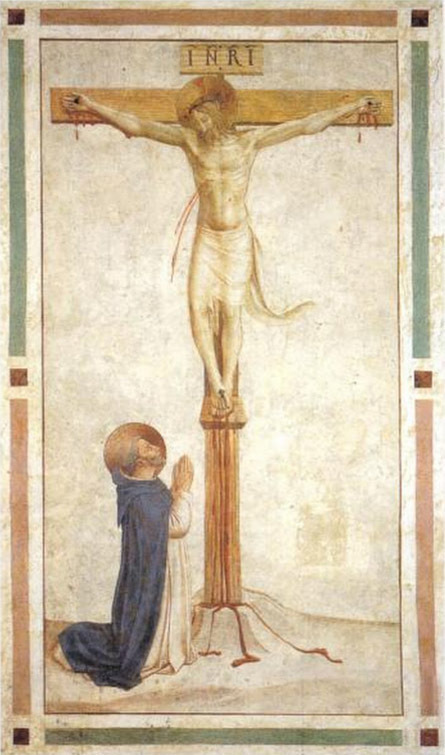 (*39) Late Gothic prototypes underlie most of the depictions of the Crucifixion, defined by a slender, ethereal Christ far removed from the solid, all-too-human type painted by Angelico in the Cloister (fig. 108). 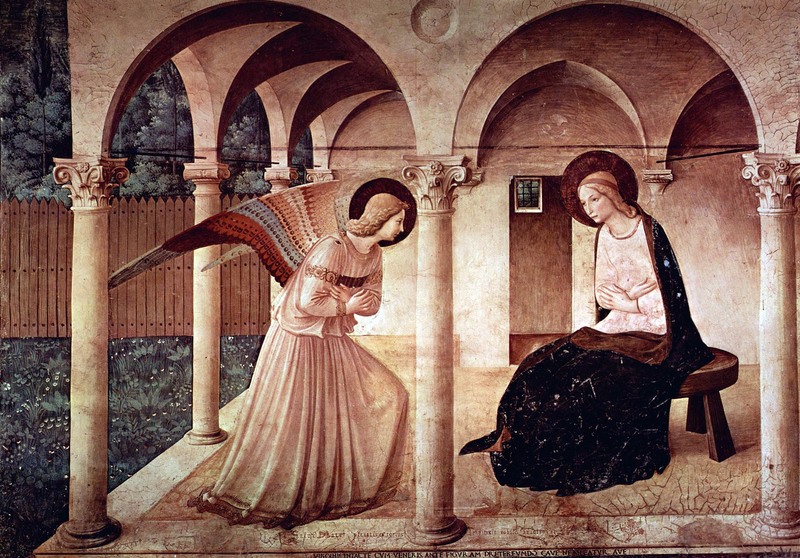 At the same time, the images of the Virgin echo examples by Angelico from the early 1430s. The intensely dramatic features of the Virgin in cell 30 recall those of her counterpart in the Deposition from Santa Trinita (fig. 53), while the simplified forms of the Virgin in cells 23 and 25 (fig. 101) are still in the Trecento tradition, and are reminiscent of the figures of Adam and Eve in Angelico's even earlier Annundation for San Domenico (fig. 51). Objectively, it seems unlikely that toward the end of the 1430s Angelico would have employed such a retardataire style, which is more plausibly understood as the effort of a follower who was not quite as accomplished as his master. 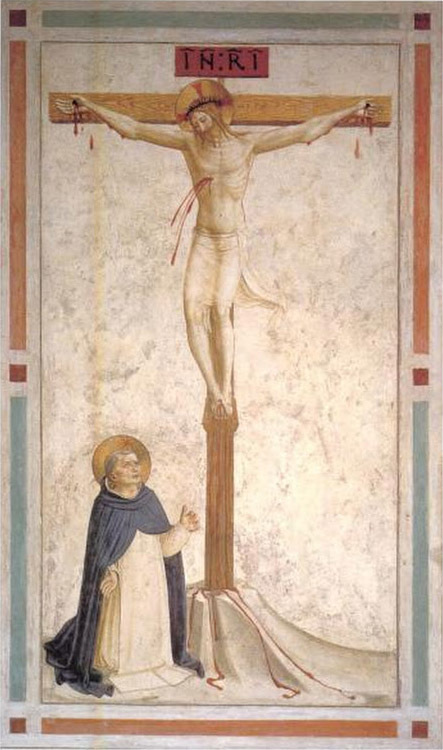 Angelico's direct participation in the execution of these frescoes should, nonetheless, not be excluded, and, moreover, it is confirmed in many instances by one or more insertions, each corresponding to a giornata, and often, but not exclusively, devoted to the representation of Saint Dominic. Certainly to be counted among these is the beautiful image of the saint in cell 25 — cited by Bonsanti(*40) — the rendering of whose face, sculpted by light, anticipates the intensely observed naturalism of the Chapter House Crucifixion. 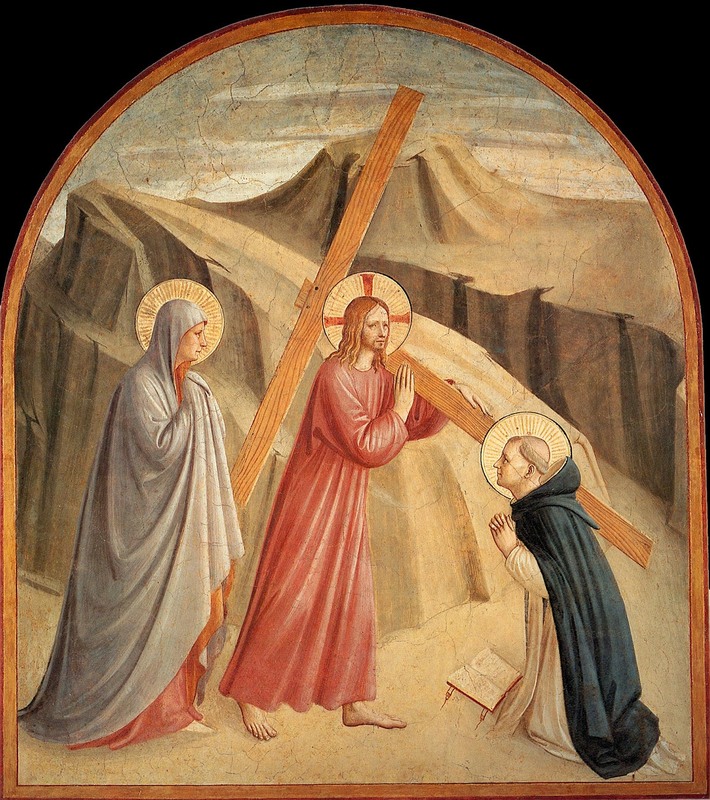 To this may be added the figures of the same saint in the Crunfixion in cell 23 and in The Way to Calvary in cell 28, which, in their typology and modeling with light, recall the Magdalene in the Noli me tangere in cell 1. 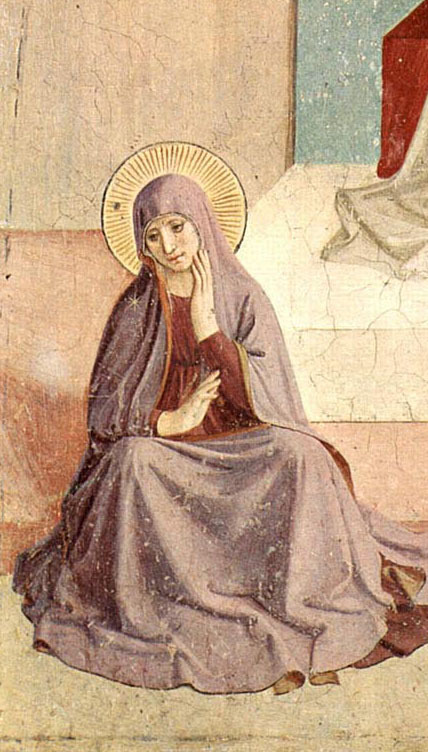 Angelico's hand may again be recognized in the portrayal of the grieving Virgin Mary in the Man of Sorrows (fig. 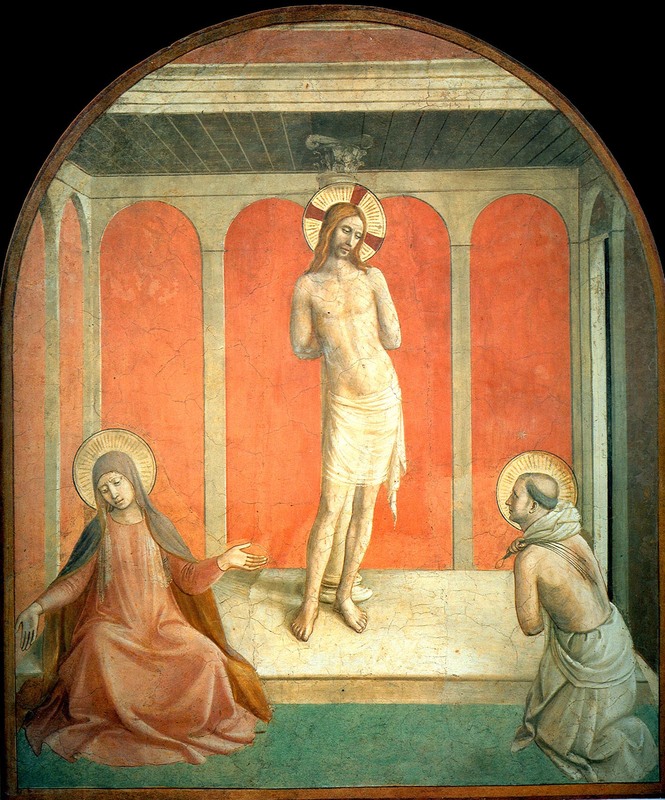 103) in cell 26, which is distinguished from other images of the Virgin painted on this side of the dormitory by its elegant outlines and compact modeling, and perhaps also in the figure of Christ in the Crunfixion in cell 23 and in 25, in which the delicacy of execution is combined with a softness of form that is absent from the depictions of the Crucifixion in the nearby cells. 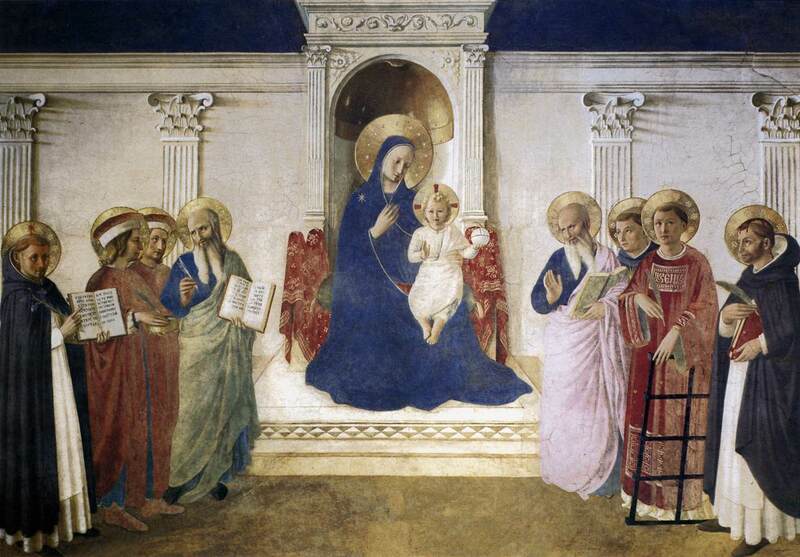 The apparent unity of conception nevertheless fails to obscure noticeable variations in style that cannot be attributed to the intervention of Gozzoli alone, suggesting a more extensive participation of collaborators — some of them new — than in the frescoes on the other side of the corridor. The identification of Gozzoli's hand in the frescoes on this side is, moreover, especially problematic for several reasons. 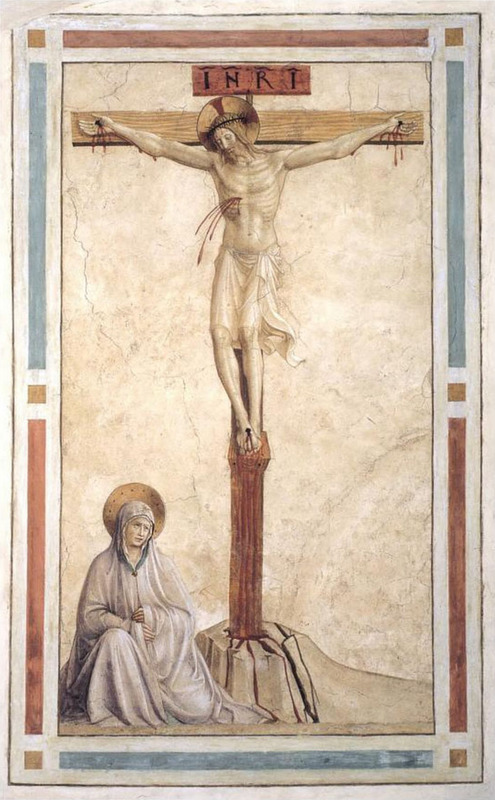 The only fresco that unmistakably reflects the artist's style — the Crucifixion with the Sorrowing Virgin in cell 22 — bears no evident relationship to his intervention in the paintings on the other side but appears, instead, to reveal a more advanced phase in his development: one that is marked by a decidedly more graphic and expressive idiom, characterized by strong contrasts of light and color, such as we find in the Medici Chapel frescoes. This would suggest a more advanced date, toward the end of the cycle or even after its completion,(*41) both for this fresco and for those stylistically related to it, in the Dormitory of the Novices (cells 15 to 21). In the frescoes in the other cells on this side of the corridor, those passages that display a stylistic continuity with the sections ascribed to Gozzoli on the opposite side are few in number, and the identification of the artist's hand in specific areas remotely evocative of his manner, such as the figures of the Virgin in cells 23 and 25, is questionable due to the more archaic quality of these details. 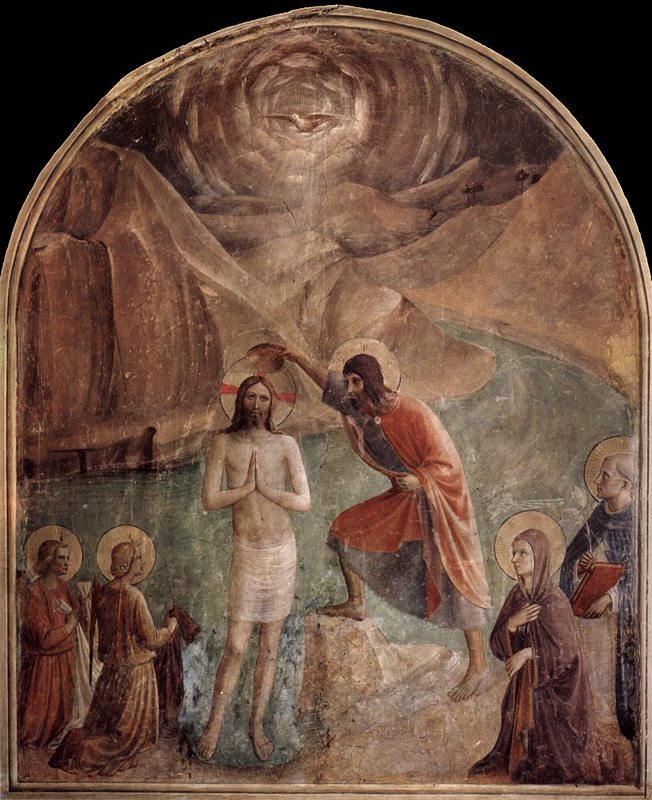 Among the new collaborators, whose artistic vocabulary is very different with respect to the other frescoes, is the painter whose hand may be identified in most of the Baptism of Christ in cell 24 (fig. 102). The composition, in which the sweeping landscape becomes the dominant element, is more descriptive in tone. 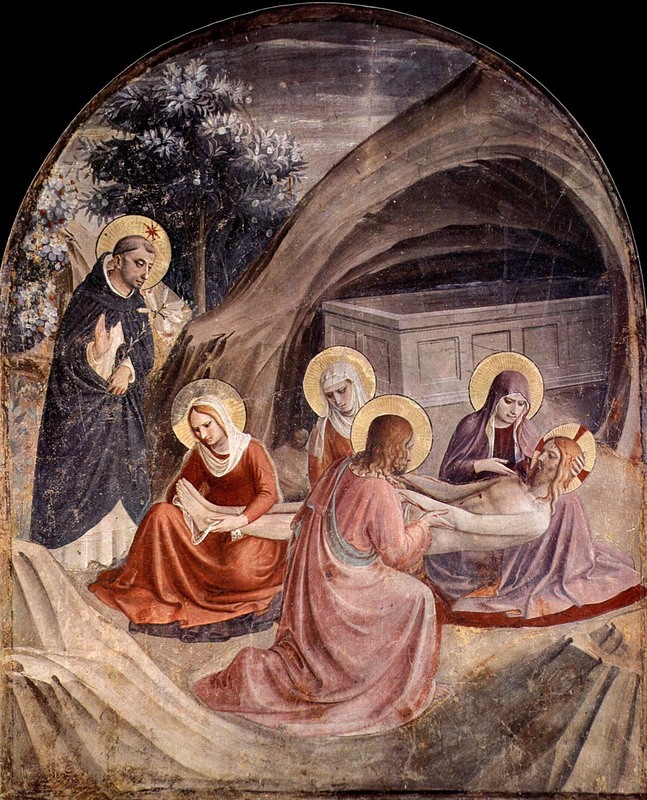 The slender inconsistency of the figures, painted with calligraphic precision and a linear emphasis that reduces their expressivity but heightens their decorative effect, is an element that distances this work from Angelico and brings to mind the style of another follower of Fra Giovanni, known until now only from panel paintings and miniatures — Zanobi Strozzi — whose intervention in the frescoes in this dormitory has already been identified in the execution of the angels in the Nativity in cell 5. 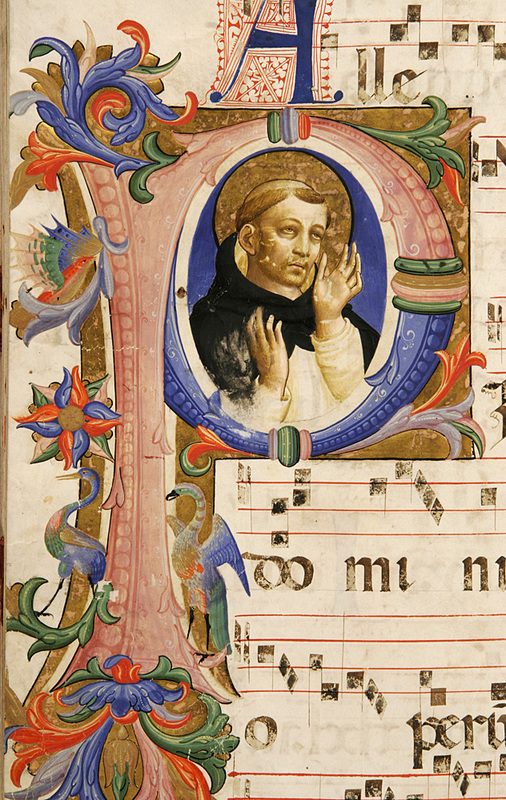 It is worth recalling that these choir books were illuminated by Strozzi (together with Filippo di Matteo Torelli) at Cosimo de' Medici's expense, between 1446 and 1453-54, with Angelico providing an estimate of the cost of the miniatures(*43) — which would appear to confirm that the two artists enjoyed a working relationship of mutual respect. 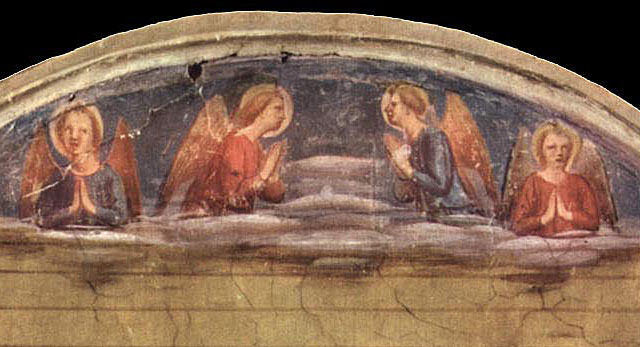 The only two figures in the Baptism fresco that may be ascribed to Angelico by virtue of their more incisive rendering are those of the Virgin and Saint Dominic,(*44) whereas the thickly painted, kneeling angels at the left, which display an affinity with the figure of the Virgin in cell 7, reveal the hand of Gozzoli. 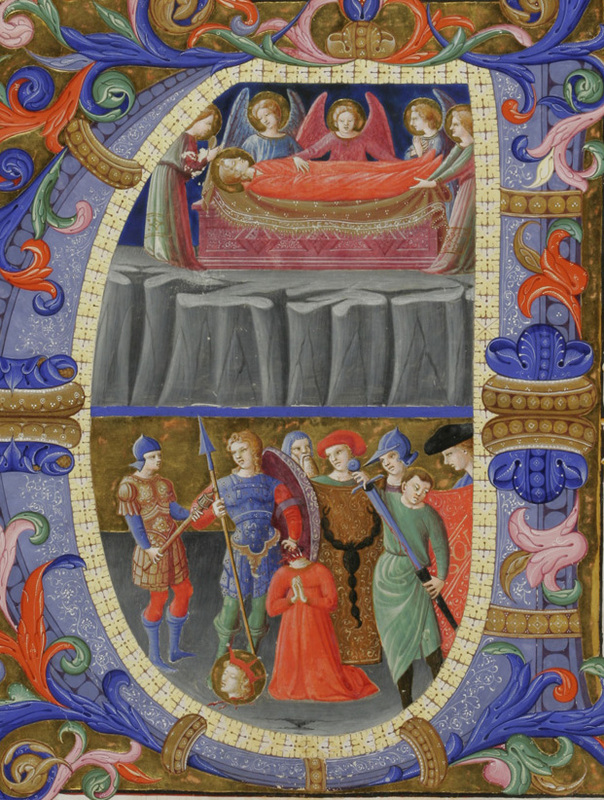 It is Gozzoli, again, who appears to have intervened in the execution of the Man of Sorrows in cell 26 (fig. 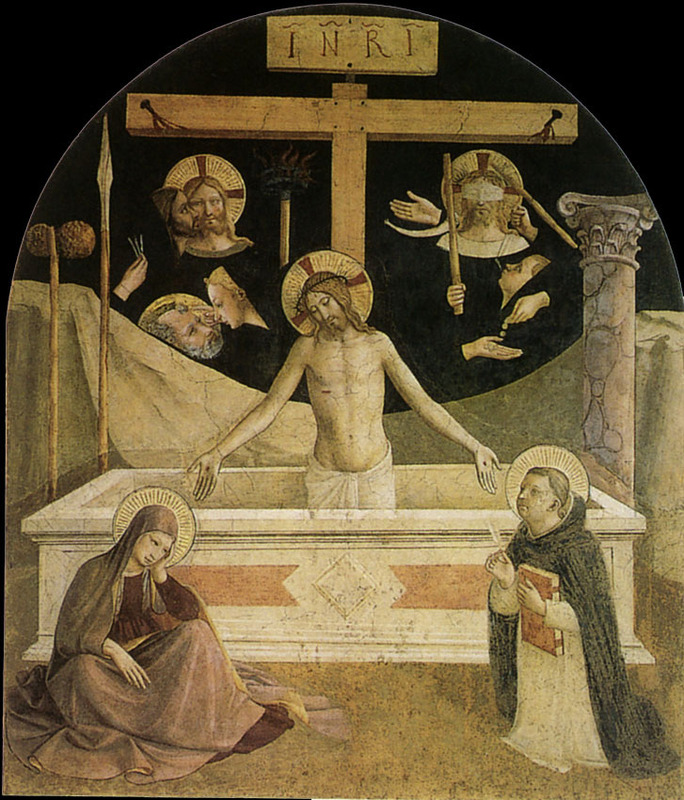 103), in the giornata that includes Christ rising from the tomb and the figure of Saint Dominic, both of which are characterized by fill, rounded forms. Руке Анжелико, помимо фигуры Богородицы, видимо, можно отнести верхнюю часть фрески с символами Страстей. Представляется, что этой картине, скорее, присущи характерные черты работы какого-то другого художника - фигурам не хватает объема и пластичности, отличающих манеру Гоццоли. Тела персонажей теряются под обильными накидками и мантиями, их материальность выражена кратко очерченными складками, выполненными широкими мазками бледного цвета, в технике, характерной для живописи манускриптов. Выразительность и типология рисунков как бы заиствована из иллюстрацийи Анжелико в миссале 558 (Музей Сан Марко), о чем свидетельствует сравнение фигур святого Петра мученика и Христа на кресте с миниатюрами из этого миссала, таких как Слава Святого Доминика на листе 67v. (рис. 48), Святой Доминик в молитве на листе 68v., или Распятие на листе 45v. 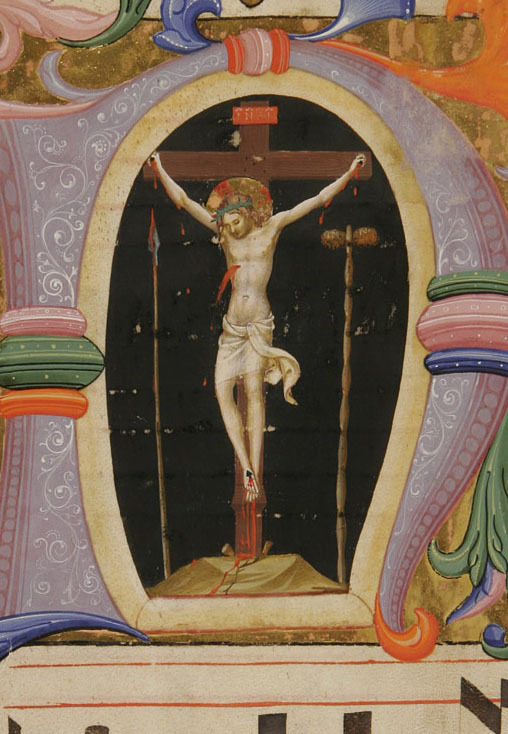 A pronounced archaism, along with other elements derived from manuscript illumination, is discernible in the Christ at the Column, with the Virgin and Saint Dominic (fig. 104) in cell 27. This is especially evident in the slender fragility of the figure of Christ, who leans against the column in an unnatural pose that is reminiscent of Gothic models; in the inconsistency of the architecture, which still possesses an unreal quality despite the attempts at perspectival foreshortening; and, finally, in the schematic rendering of the facial features, defined with dark outlines and heavy white highlights. 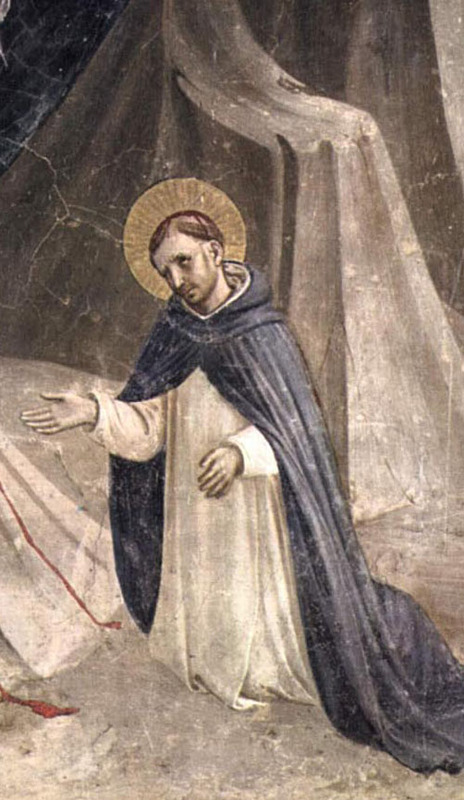 Even the figure of the Virgin — which, like that of Saint Dominic, is distinguished by a greater physical presence perhaps became it might have been executed by another painter — betrays echoes of the late manner of Lorenzo Monaco and of artists in his circle. A comparison of this fresco with the miniature in the San Gaggio antiphonary of the Beheading of Saint Catherine (folio 32v) sheds further light on the issue. 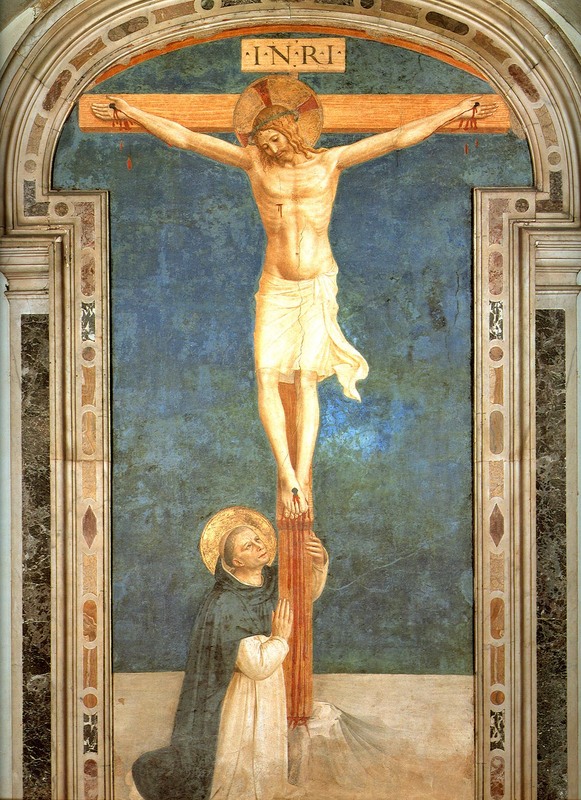 Also the result of a collaboration, it would appear, is the fresco of The Way to Calvary in cell 28, in which the luminous solidity of the figure of Saint Dominic, executed by the master, is juxtaposed with the delicately conceived Christ, of uncertain attribution; clearly distinguished from them both is the figure of the Virgin, which, in its excessive proportions, reads as a flat and rigid reinterpretation on the part of a collaborator of a prototype by Angelico. The archaic style encountered in the frescoes on this side of the east corridor is widespread, suggesting that a rethinking of the chronology of the decoration of this dormitory is in order. It is not a given, in fact, that the frescoes along the outer wall were executed before the ones on the inner wall,(*47) if only because the dating of the former, as a whole or in part, may be advanced after considering the unquestionable stylistic relationship between the Lamentation in cell 2 (fig. 149) and the Lamentation panel for Santa Maria della Croce al Tempio (fig. 76), completed in 1441. 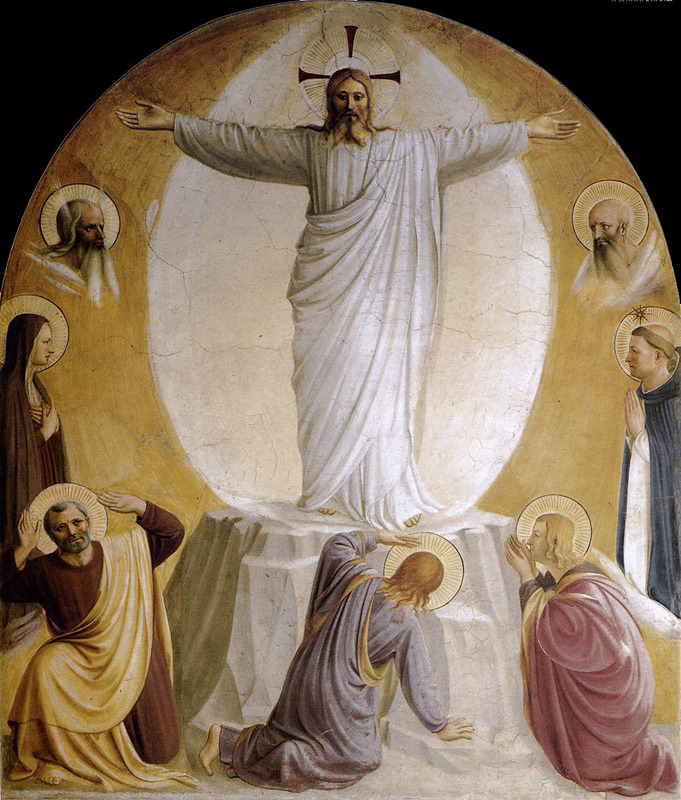 Also note the stylistic continuity that links such frescoes as The Transfiguration in cell 6 (fig. 97) with the Madonna of the Shadows (fig.127) on the opposite side of the same corridor — a work unanimously regarded as late in date and executed, in any event, after 1440. 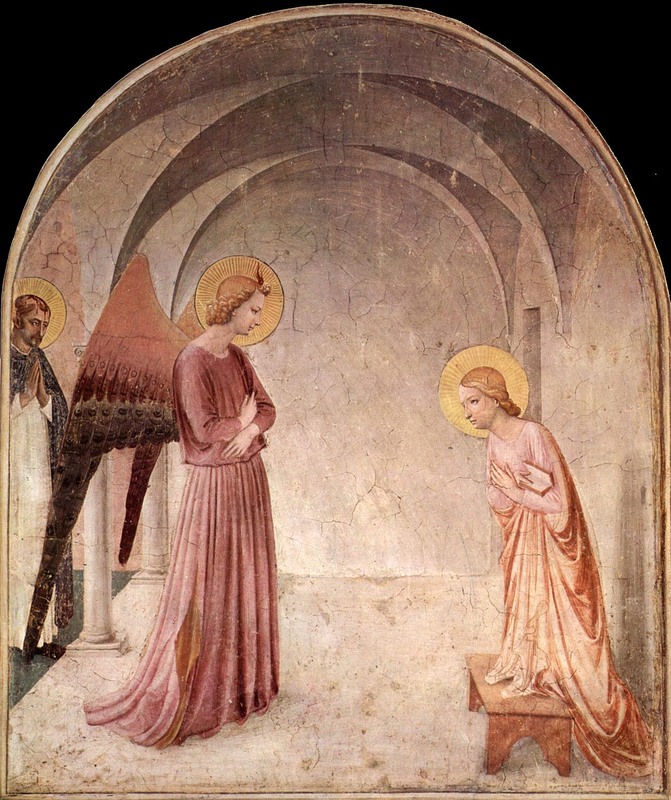 To a new phase of work, which includes the Annunciation (fig. 106) on the wall of the north corridor, belongs the Noli me tangere in cell 1, located in a space that is part of the same building block. These paintings are enriched by the treatment of light, which bathes the colors in a luminous glow — especially the finely modeled flesh tones — and lends brilliance and luster to the halos, while the landscape and the architectural setting take on added significance along with the figures. The dating of these two frescoes should be contiguous to that of the Crucifixion in the Chapter House (fig. 107) and of the frescoes on the ground floor. 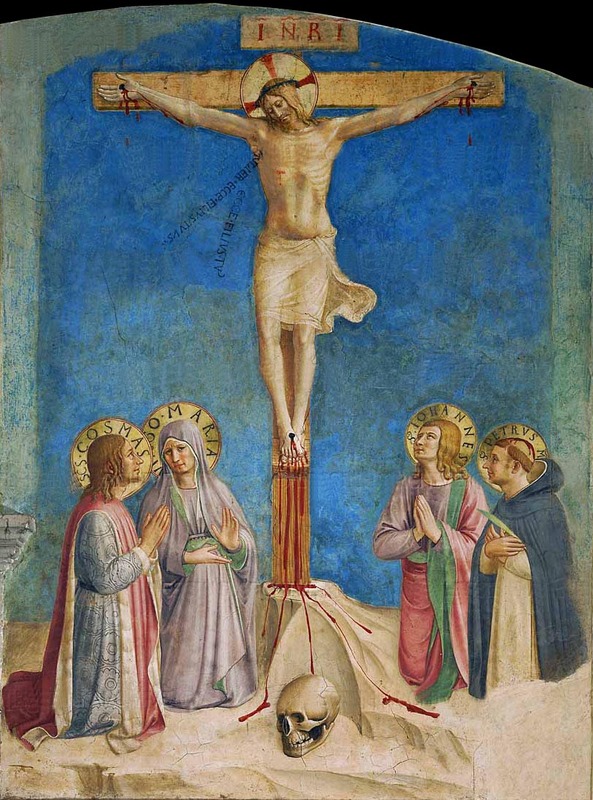 Angelico's direct involvement in the execution of the Crucifixion extends to most, if not all, of the fresco.The painted figures are characterized by the slow, rhythmic movements and gestures that we have come to recognize as a constant quality of the master's style, and their draperies fall in soft folds, defined by highlights that further accentuate the already pale, translucent palette. The finely sculpted faces — in which every single feature and plane is defined by subtle hatchings and by effects of light created by revealing the base tone, rather than by the addition of white — are animated by a new expressive intensity and by a piercing naturalism that has recently led to the hypothesis, as fascinating as it is bold, of the collaboration of Jean Fouquet (who passed through Florence in the entourage of Rene d'Anjou) in their execution. 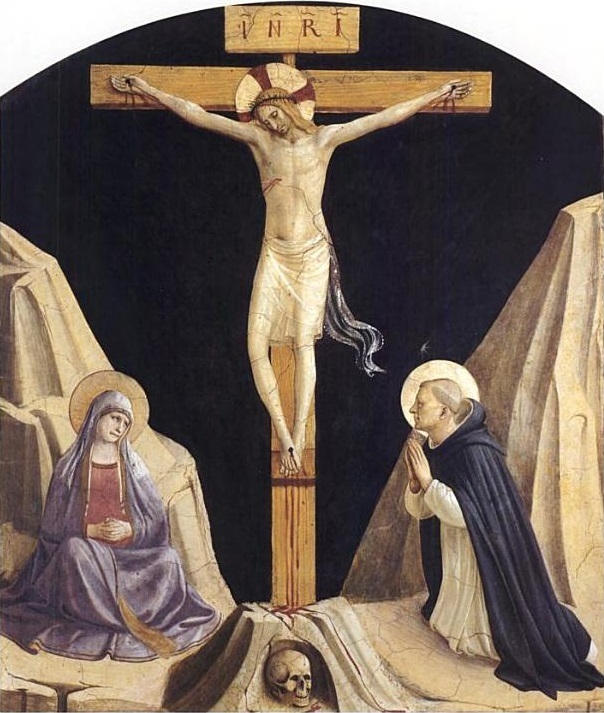 (*48) Despite this intriguing notion, I think it is more probable that the importance assumed by light in the work of Angelico at this date, culminating in the fresco of Saint Dominic in Adoration before the Crucifix (fig. 108) in the cloister, is the result of the further evolution of his art, in which the circulation of Netherlandish paintings, surely increased by the foreign presence at the Council of Florence of 1439, certainly played a role; to this may perhaps be added a specific awareness of works by Fouquet, who, for his part, must also have been receptive to Angelico's innovations. It is my view, although contrary to widespread opinion, that Angelico's refined approach may also be discerned in the execution of many of the figures painted, in separate giornate, in the hexagons of the decorative band around the Crucifixion: specifically, Zacharias, Isaiah,(*49) Jacob, Jeremiah, Pseudo-Dionysius the Areopagite, and, perhaps also Job and Ezekiel (fig. 111), whose linear but intense features recall those of some of the figures in the frescoes in the upper cells. 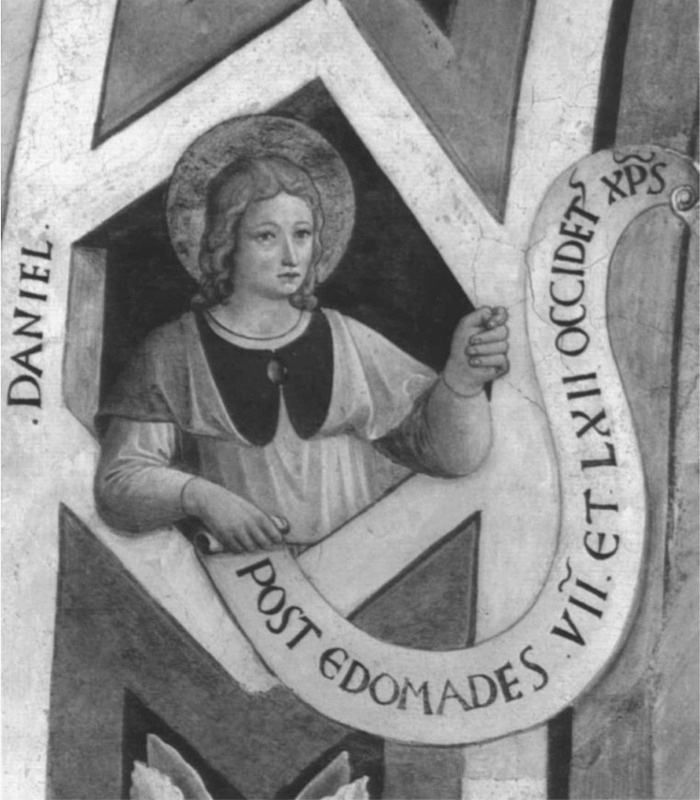 The images of David and Daniel (fig. 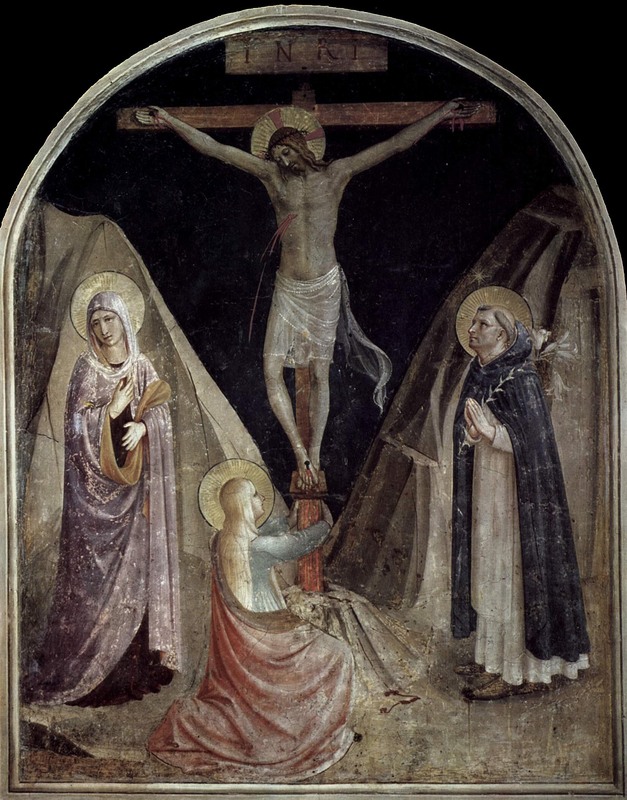 112) may be ascribed to an anonymous collaborator with a cursory style, whereas the hand of Gozzoli — possibly the author only of the Erythraean Sibyl — may be identified in many of the realistic physiognomies of illustrious personalities of the Dominican order, painted in the medallions below the Crunfixion. The decoration of the cells in the north corridor, intended for lay brothers and non-religious guests, must have taken place contemporary with — or shortly after — the frescoes on the ground floor. In these works we sense a noticeable change in style: the overall tone is more descriptive; the landscape acquires greater importance; the palette becomes clearer and more varied, enriched by new color harmonies; and the technique is more rapid, concerned with the overall effect rather than with the particulars. Angelico, still in charge of the compositions, seems, on the one hand, to have adjusted his pictorial vocabulary to fit the changed audience for these images, and, on the other hand, to have been hard pressed by time constraints, thus assigning increasingly greater parts to his collaborators and limiting himself to only a few autograph passages. The presence of the hands of assistants in the frescoes in these cells is so evident as to leave no doubt as to their intervention. Closer scrutiny of the frescoes and identification of the different giornate would be warranted here as well, in order to better assign specific sections to the various assistants — a task too lengthy to be carried out in the present context. Starting with the premise that, in this wing, the possibility of Zanobi Strozzi's participation may be proposed only for the fragment with the Entry into Jerusalem in cell 33a — in which may be recognized the same calligraphic approach already encountered in the Baptism — and disregarding, for the moment, those passages in which the intervention of less-talented assistants is beyond question, what remains essential is to identify the sections executed by Angelico alone and those by Gozzoli. Only through such a process will it be possible to interpret the remaining frescoes, and to address some of the questions they still pose. It should be noted that three of the frescoes — the Agony in the Garden (fig. 110) in cell 34, the Adoration of the Magi (fig. 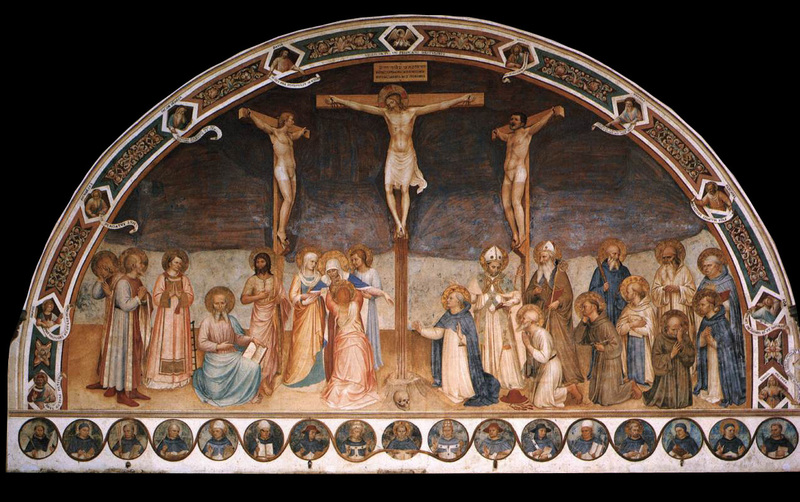 109) in cell 39, and the Crucifixion, with the Virgin and Saints Cosmos, John the Evangelist, and Peter Martyr in cell 38 — in which scholars have repeatedly claimed to recognize Gozzoli's whole or partial intervention, are not, in fact, stylistically homogeneous. 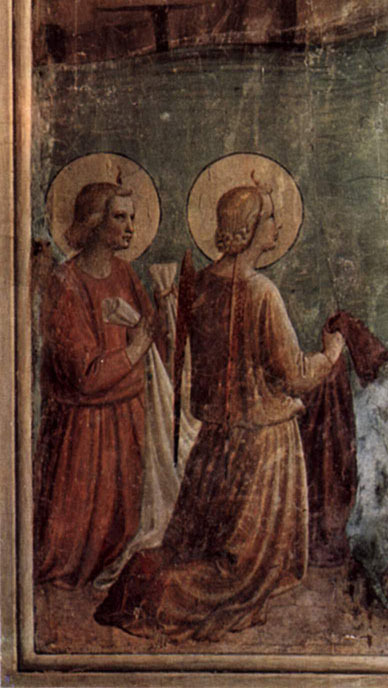 In the first fresco, the attribution to Gozzoli of the figures of Mary and Martha may be justified by a comparison with the frescoes in Montefalco; at the same time, the luminous clarity and spatial depth of the fragment of interior in which they are shown praying, and the close analogy, even in technical terms, between the face of Mary and that of the Virgin in the Chapter House Crucifixion also speak in favor of Angelico's authorship. It could be reasoned, therefore, that at the time of the north corridor frescoes, Gozzoli was a faithful imitator ofAngelico — however, not in the same way as in the frescoes in cells 38 and 39. 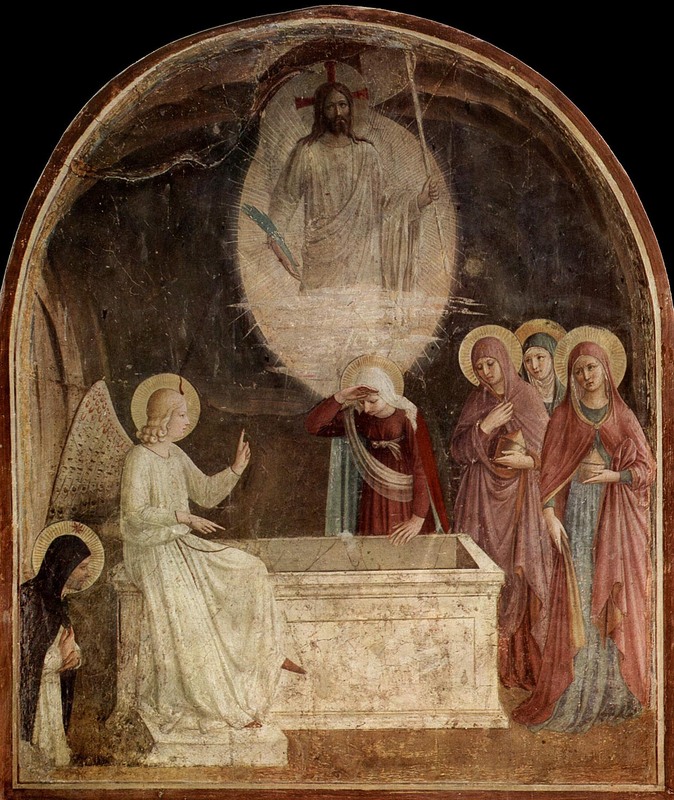 In the Crunfixion in cell 38, only the face of theVirgin is comparable in style and technique to the faces of the two figures in cell 34, while the rest of the scene is painted in a much more cursory manner and with a calligraphic style that is found only rarely in the work of Gozzoli: for example, as in some of the background figures in the Medici palace fresco of the procession of the Magi. In the Adoration of the Magi in cell 39, only the figures in the procession, to the right, painted in the space of two working giornate (out of a total of fifteen), are characterized by this abbreviated, calligraphic style.These figures are highly expressive, nevertheless, even if partially incomplete, corroborating the hypothesis of a hurried, unfinished execution. The treatment of the four adjacent figures appears similar, with the exception of the heads, which are distinguished by carefully lit and precisely modeled features, indicated with finely hatched lines, in much the same way as the head of the young king (fig. 113), whose profile recalls that of the angel Gabriel in the Annundation. The mapping of the giornate aids in the process of interpretation, clarifying that the heads of the four individuals engaged in discussion were painted on a single giornata, distinct from those on which the rest of the figures were painted, exactly as was done for the head of the young king, thus providing a solid foundation on which to base the hypothesis of another artist's intervention. 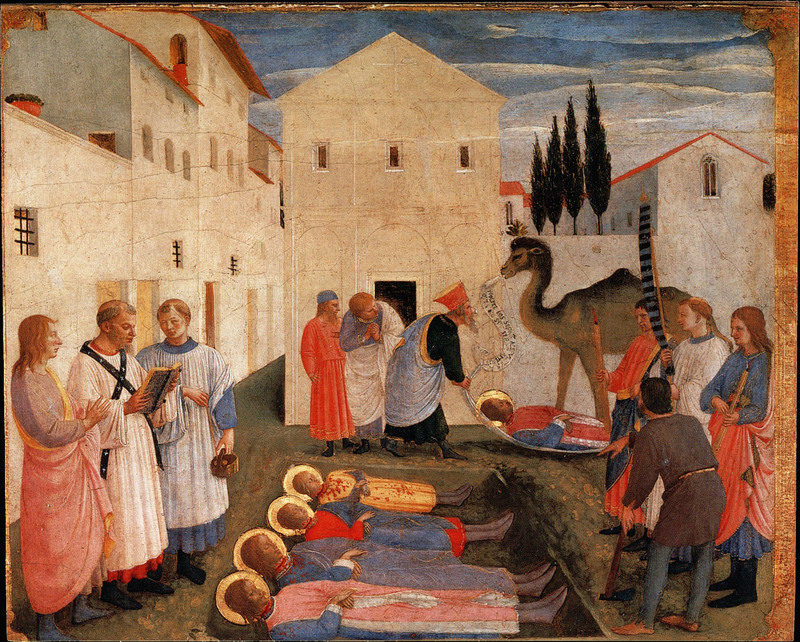 A different idiom informs the execution of the nearby figures in the center, which were painted on one giornata (with the exception of the head with the turban, on the right, and that of the aforementioned young king), as well as the execution of the other two kings, one kneeling and one prostrate before the Virgin, which were painted on two separate giornate.The figures, here, have lost all plastic credibility; the mod-eling is flattened by the urunodulated juxtapositions of brilliant color; and the quick touches of highlights on the faces fail to achieve the same level of expressivity observed in the previously cited heads. There is sufficient evidence to assign these parts to another, unidentified collaborator, who may also have been responsible for the figures of theVirgin and Child and of Saint Joseph; perhaps the same artist who intervened in the execution of the Patriarchs, in the Descent into Limbo, as well as in other frescoes on the inner wall of this corridor. One of the possibilities to emerge from these observations is that Gozzoli was the author of the individuals on the right, and that, with the exception of the heads, he also painted the two figures in the center, shown from behind and in profile, whose draperies are similarly constructed and colored. Another, unknown assistant may have painted the remainder of the scene, while it would appear that Angelico left his imprint on a few splendid details: the head of the young king, and probably those of the four bystanders in conversation.This is not, nor has it previously been the only hypothesis that may be advanced to explain the structure of Angelico's workshop — an issue that is hardly resolved — but it is merely intended to serve as a starting point for further inquiry and investigation. (*1). The fifteenth-century Cronaca of Fra Giuliano Lapaccini, a resident in San Marco until his death in 1458, is inserted in the Cronaca written by Fra Roberto degli Ubaldini da Gagliano, which he began in 1509 (San Marco n.370, Biblioteca Medicea Laurenziana, Florence); Lapaccini's text is published in Motcay 1913, pp. 3-31. In reference to the San Marco frescoes, Lapaccini writes: "Nam tabula altaris maioris et figurae capituli et ipsius primi claustri et omnium cellarum superiorum et Crucifixi refectorii omnes pictae sunt per quendam fratrem ordinis praedicatorum et conventus Fesulani qui habebatur pro summo magistro in arte pictoria in Italia, qui frater lohannes Petri de Mugello dicebatur, homo totius modestiae et vitae religiosae" (p. 16). 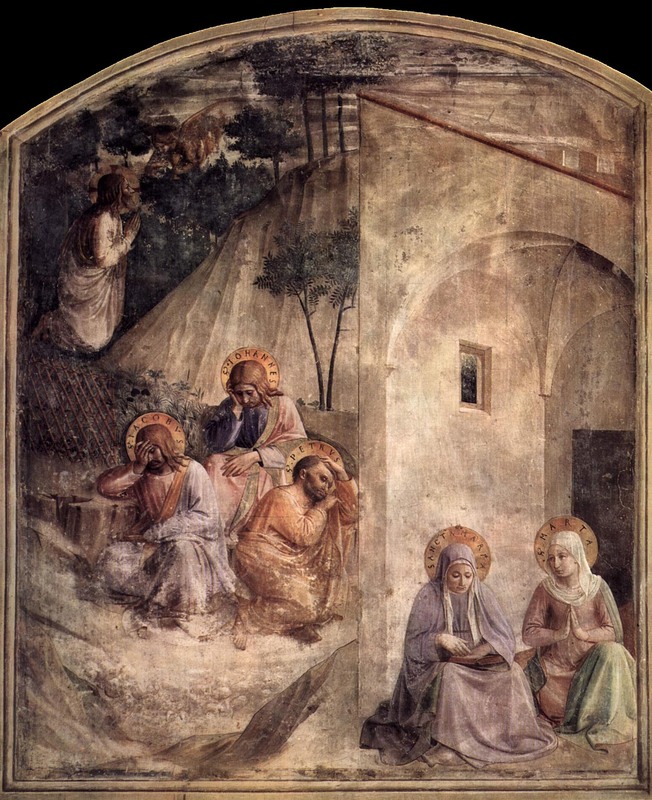 Other sources, discussing the paintings by Angelico in San Marco, explicitly name only those in the Chapter House as well as the high altarpiece, and refer to the rest in general terms (see A. Manetti 1490 [?] [1887 ed. ], p.166; Albertini 1510 [1863 ed. ], p. 12; Il libro di Antonio Billi 1516– [1991 ed. ], pp. 77, 128; Il codice magliabechiano 1536-46 [1892 ed. ], pp. 94-95). (*2). Berenson 1896, pp. 23-26, 99-100; Berenson 1932a, pp. 20-22. (*3). Among the first to notice the presence of collaborators were J. A. Crowe and G. B. Cavalcaselle (1883, pp. 383-84), followed by Wurm (1907), Venturi (1911), Van Marle (1928), Muratoff (1930), Schottmuller (1911; 1924), and Bazin (1949). For an extensive bibliography related to each fresco, see the recent monograph by Spike (1996, pp. 203-56). (*4). The possibility of Strozzi's participation in the frescoes in the cells of the north corridor (numbers 31-35) was advanced by P. D'Ancona (1908, p. 12), followed by F. Schottmuller (1924, p. XXIX). A. Francini Ciaranfi (n.d., p. 12) subsequently discerned Strozzi's involvement in the execution of the angels in the fresco in cell 5, although she rejected the parts identified by P. D'Ancona (1908). M. Salmi (1958, pp. 44, 46) reiterated P. D'Ancona's proposals, adding the suggestion that Strozzi might also have been responsible for parts of the frescoes in cells 8,36, and, alongside Benozzo Gozzoli, in other cells in the north corridor. 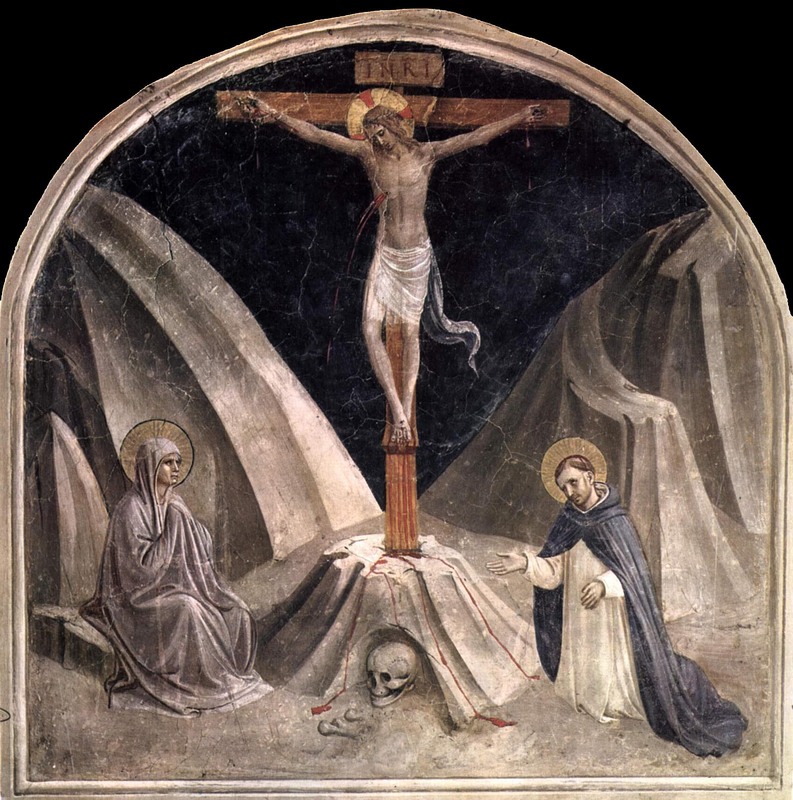 To Gozzoli were attributed, initially, the Crucifvcion with Saints in cell 38 (Venturi 1911, part I, pp. 58,70-72), the Adoration of the Magi in cell 39, and some of the figures in the Chapter House Crucifixion (Gengaro 1944). A. Francini Ciaranfi (n.d., p. 9) associated Gozzoli with the series of frescoes of Saint Dominic at the Foot of the Cross in the cells of the south corridor, and M. Salmi (1950, p. 154) attributed to him the female figures in the painting in cell 34 and in parts of the one in cell 36. (*5). According to Pope-Hennessy (1952, pp. 17-23,179-87; 1974, pp. 19-29, 202-10), a total of three assistants were involved in the cycle: the Master of Cell 2 and the Master of Cell 36, who closely followed Angelico, in addition to the more independent Master of Cell 31. (*6). Salmi 1958, pp. 40-50,113-14. (*8). Collobi-Ragghianti 1955b, pp. 40-41. (*9). U. Baldini, in Florence 1955, pp. 120-32, and reiterated in Baldini 1970, pp. 104-7. (*10). Bonsanti 1983, pp. 25-34. (*11). G. Bonsanti essentially accepts the view previously expressed by L. Berti (in Berti, Bellardoni, and Battisti 1966), while at the same time limiting the extent of Angelico's direct participation. (*12). Padoa Rizzo 1969a, pp. 52, 62; A. Padoa Rizzo (1969b, pp. 9-13) cites cell 23, but from the illustration it seems that she intended to refer to cell 22; Padoa Rizzo 1972, pp. 17-19. (*13). See Padoa Rizzo 1972, pp. 17-19. (*14). Padoa Rizzo 1992; Cole Ahl 1996; Garibaldi 1998; Toscano and Capitelli 2002. (*15). Bonsanti 1990, pp. 165-72; Bonsanti 1998, pp. 544-46; Bonsanti 2003, pp. 47-62. (*16). Padoa Rizzo 1992, pp. 6-7, 27-29; Padoa Rizzo 2002 b, p. 20; Padoa Rizzo 2003, pp. 23-29. (*17). Bellosi 1996, pp. 26-28.W. 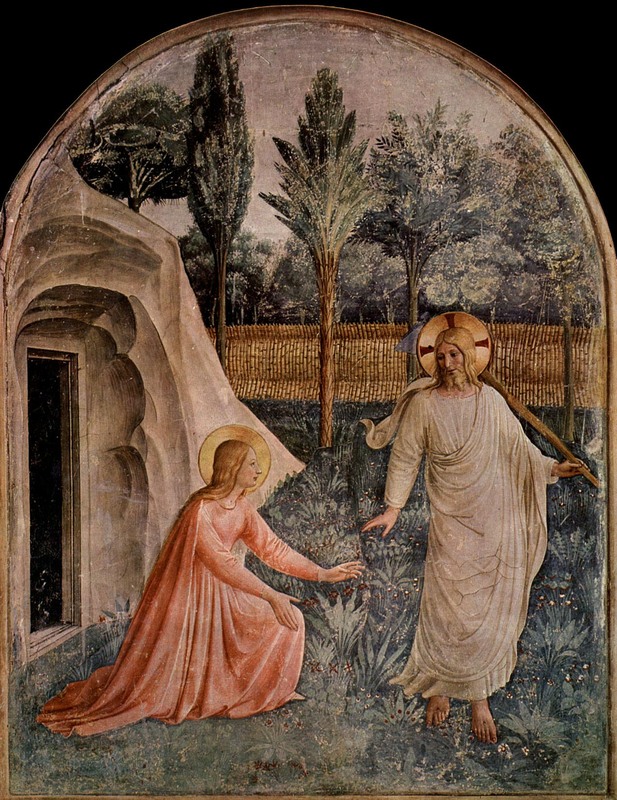 Hood (1993, p. 211) also remains cautious about the various attributions to Gozzoli, with the exception of the fresco of the Noll me tangere in cell 1. (*18). Morachiello 1995, pp. 294-98; Cole Ahl 1996, pp. 8-18, 285-86; Acidini Luchinat 1994, pp. 4-6. (*19). Boskovits 1983, pp. 11-23; Boskovits 1994, pp. 369-96. (*20). Boskovits 2002b, pp. 41-56. (*21). See Centi 1989, pp. 13-54. For a summary of the early history of the Dominicans at San Marco, see Scudieri 2000, pp. 9-43. (*22). Morcay 1913, p. 13. (*23). The account is confirmed by the discovery of some fragments of fourteenth-century decoration on the wall facing the cloister. See M. Scudieri, in Damiani, Marchetti, and Scudieri 1995, pp. 13-22. (*24). Centi 1989, p. 15. (*25). Cole 1977, pp. 95-100. (*26). Illustrated in Spike 1996, p. 197. (*27). Motcay 1913, p. 14. (*28). Ibid. The notice of the gift of Lorenzo di Niccole's altarpiece to the convent in Cortona is confirmed by the letter of thanks addressed by the priors of Cortona to Cosimo de' Medici in 1438; Vasari (Milanesi ed.) 1878-85, vol. II, p. 533. (*29). For the inscription, see Vasari (Milanesi ed.) 1878-85, vol. II, p. 533. (*30). The question has been addressed by the present author on several occasions (M. Scudieri, in Rykwert and Engel 1994, pp. 523-25; Scudieri 1998, pp. 107-13), also taking into consideration the studies of the building complex by F Carbonai and M. Salmi (in La Chiesa e it Convento di San Marco 1989-90, vol. I, pp. 266, 290-93), who already had speculated about the original existence of an east arm of the transept, after noticing a reduction in the thickness of the wall in that area, which could be explained by a later repair. (*31). See U. Baldini, in Florence 1955, p. 132. (*32). Morcay 1913, pp. 14-16. (*34). Ibid., p. 21. On the library of San Marco, see Scudieri and Rasario 2000. (*35). Orlandi 1955a, pp. 3-37. (*36). De Marchi 1985, pp. 53-57. (*37). 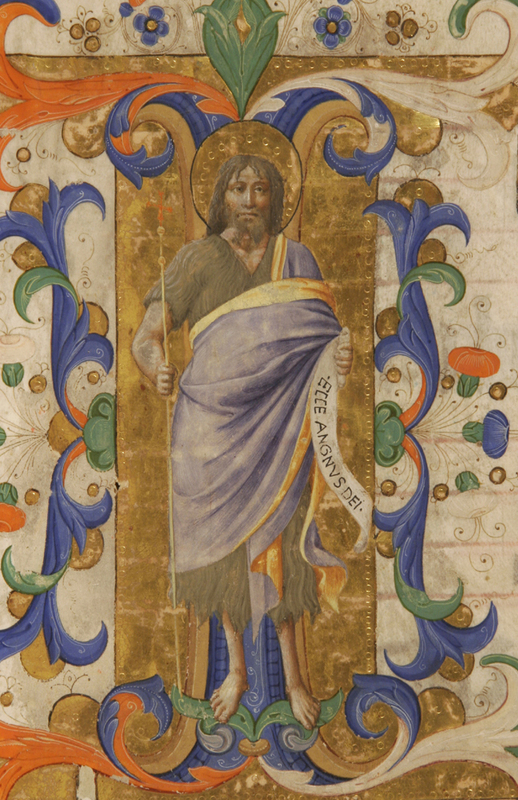 The existence of fully developed workshops employing a significant number of assistants, whose presence may be detected not just in minor passages in the cycle — and whose names are sometimes recorded in documents — was recently reconfirmed by the results of the latest restorations, in the case of fresco projects directed by Angelico as well as by Benozzo Gozzoli (see Giantomassi and Zari 2001, pp. 99-109; Testa 1996, pp. 26-31; Toscano 2002, pp. 57-77). (*38). See Bonsanti 1990, p. 165; Padoa Rizzo 1992, p. 27; Cole Ahl 1996, p. 14; Acidini Luchinat 1994, p. 4. (*39). The presence of elements distantly derived from Lorenzo Monaco was noted by L. Bellosi (1996, p. 23). (*40). Bonsanti 1983, p. 31. (*41). The possibility of a later dating was also advanced by L. Bellosi (1996, P. 27). (*42). The illuminations are reproduced in Scudieri and Rasario 2003, pp. 174, 179, 176, 171, respectively. (*43). See A. Di Lorenzo, in Di Lorenzo 2001, pp. 16,20-21. (*44). The same opinion is shared by L. Bellosi (1996, p. 22). (*45). 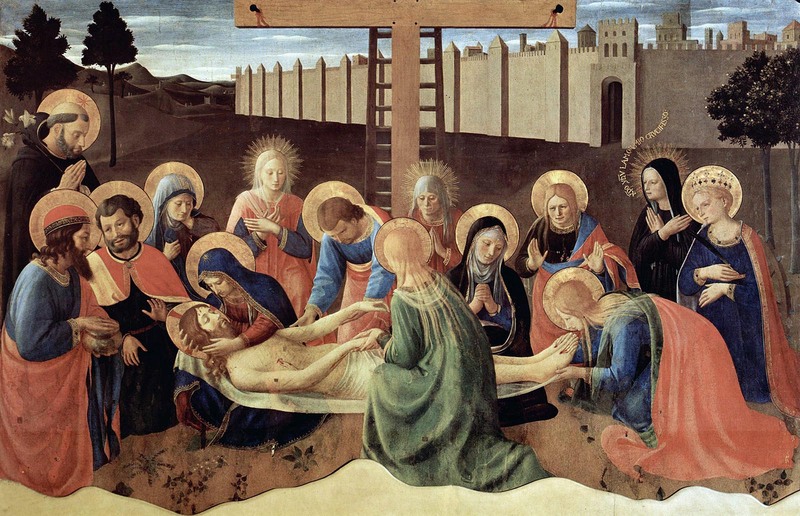 The fresco was first attributed to Gozzoli by A. Padoa Rizzo (1969a, p. 52), who dated it 1442-44. (*46). On the relationship between Sanguigni and Angelico, see Scudieri 2003, pp. 33-43. (*47). Bellosi 1996, p. 25. (*48). Sricchia Santoro 2003, pp. 55-56. (*49). They reflect a strong affinity with the figures of Saint John the Evangelist and Saint Paul painted on the pilasters of the Perugia polyptych.